Central University of Haryana - CUH published an official notification for Recruitment of Assistant Professor, Associate Professor & Professor for 168 posts. Eligible candidates can apply for this recruitment. You can view more details about this recruitment including No. of posts, name of post, Educational qualification, Age limit, Selection process, How to apply etc... You can also view official notification and other important facts about this recruitment e.g. Important links and Important dates. Educational qualification: DEPARTMENTS shall be as per UGC Regulations on Minimum Qualifications for Appointment of Teachers and other Academic Staff in Universities and Colleges and Measures for the Maintenance of Standards in Higher Education 2010 as amended from time to time for which Page 4 of 4 UGC website may be referred. Application Fee: Rs 1000 for General/OBC Candidates through online payment mode and No fee for ST/SC/PH. 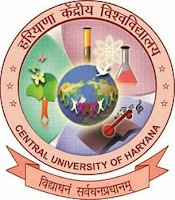 Address: Assistant registrar Recruitment Cell Central University Of Haryana Jant-Pali Mahendergarh Haryana – 123029.